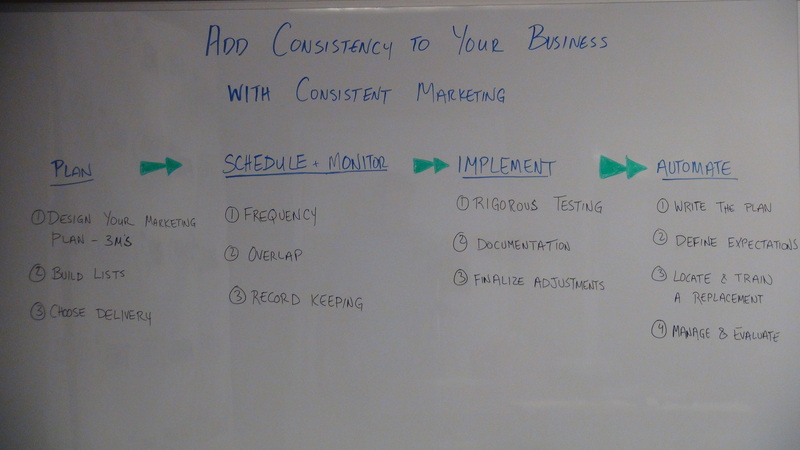 In this video Josh Weidman discusses key ways to add consistency into your business. The most important thing is automating your marketing so you continue to reach sellers, buyers and lenders while you are working on other parts of your business. Hi, thanks for joining me for today’s REI360’s Training. Today, we’re going to talk about something that I think is a common theme with many of my coaching clients, and that is consistency and automation. These two things can mean the difference between doing a handful of deals and doing dozens of deals on an annual basis, and often times, my clients come to me because they want to go from doing 15-20 deals a year to doing 50-100, 150 deals on an annual basis. There’s no way you can do that without consistency and without some type of automation to get the job done even though you’re not sitting there doing it. What I’m going to talk specifically about here is consistency automating or consistently marketing. Marketing is probably one of the most important parts of any business, and I say that because without leads, you’ve got no deals, and without deals, you don’t have any income, and without income, you’re dead. There’s no sense of being in business without the income. I’ve broken this down into four simple steps to take you from that hands on daily need-to-market-sometimes-it-gets-done-sometimes-it-doesn’t to a consistency that happens whether you’re thinking about it or not. So, this whole thing is going to start with a plan, obviously. What do I mean when I say a plan? Well, I’ve done other trainings on marketing and what it is – the 3 M’s of marketing – but as a brief overview, you’ve got the three M’s of marketing: they are the market, the people who you’re advertising to, you’ve got the media, which is the way that your message is delivered, and the third part is the message; what you’re saying to them. What you want to do is you want to have a plan to attack these people or to market to them or to advertise to them. The plan might me I might send out so many postcards to a given area, or I’m going to put together a certain mailing list. Let’s say it’s for non-owner occupied owners. I’ll also a mailing list for people that have tax balances, or you’ve got people that have maintenance issues, or LNI violations. Whatever that is, you’re going to have these lists – you have them made up. The next part of that is going to be, once you have the list built, the next thing you want to do is figure out what the delivery method is. Are you going to mail them a postcard? Are you going to advertise in the newspaper? Are you going to advertise online? Is this going to mean email campaigning? Are you going to do postcards? Are you going to do bandit signs? Are you going to do billboards? What way is it going to be delivered? And then lastly, you want to put together your message. So, this feeds right into the next step, which is going to be schedule and monitor. One thing that I’ve neglected to say when we started the training is that all of these steps and with this idea of automation in mind, we want to start to process with that end game in mind. We want to set this up so that we do not have to be involved. So, when we’re planning, the next step after we are building our list, we’re determining how we’re going to deliver it, we’re writing all of our messages, we’re going to talk about how frequently we have to deliver these messages. Sometimes, if it’s a postcard campaign – let’s use a postcard campaign as an example – if I have a non-owner occupied list, I’m going to send them a series of postcards, and it’s not just going to be one. Sometimes it’s four or five, sometimes it’s one or two, but in a non-owner occupied mailing list, I’m probably going to send them four mailers. First mailer is an introduction; just says, “Hi, my name is Josh Weidman. I’m a real estate investor. I pulled up your information on public record, and I found that you own the property at 123 Main Street. I’m very interested in purchasing the house if you’re interested in selling. Please contact me. Here’s my phone number.” Very simple. The third mailer will be a, “Hey, I don’t know if you haven’t gotten my correspondence” type letter. Or postcard or whatever. With this four postcard campaign, what I’ll usually have is I’ll have a big burst of calls on the first go around. And then not so many on the second, but by the third, I have another big surge in calls, and by the fourth, it just kind of trickles out. But what this allows me to do is touch the same people over, and over, and over again. These messages are fairly consistent. The whole idea here is to set up a frequency. How many times am I going to mail to these people? How frequently am I going to reach out to them? And what is the overlap of my marketing? So, let’s say that you have this non-owner occupied list, but you’re also sending out an email blast to small banks. You want to make sure that your leads are not all surging at the same time every month, that they’re not all surging at the same time every year; so, maybe at the end of each quarter, you have these huge spike in leads that you can’t even handle, but then all the other times, you’re sitting there, and the phone’s not ringing. So, you want to time the overlap and the frequency of your marketing so that you have a consistent lead flow. Well, what am I talking about? So, with my non-owner occupied mailing list, I will send them a mailer about every three weeks. Like I said, the first mailer I’m getting a big surge, and the third mailer I’m getting a big surge, but the second two not so much. So, what I’m going to plan to do is plan another marketing campaign that starts at the same time my second mailer for the non-owner occupied goes out, I’m sending out the first mailer for another marketing piece, and then in-between, I’m sending out emails, and I’m doing other things. So, I have three or four different small marketing campaigns that are targeting different people and different groups that are motivated sellers that are going to send me leads so that I constantly have a good source and good leads. As this goes on, one of the most important parts at this point in the game is to devise a record-keeping system. Now you’re saying, “Well, why the heck do I have to do this? This sounds like an awful lot of work.” You know what? Up front, it is. It’s going to be more work upfront getting this all set up, but once it’s done, you’re never going to have to touch it again. I can’t emphasize that enough. The idea here is to be able to keep records on the leads that are coming in, both on the counts and phone numbers and contact information for the people that are interested in selling your property. Well, why? Well, if you are not the one that’s sending out the marketing pieces, and you don’t know what is going out, you’re not going to have a gauge on your return on investment, or even whether this is being done. By setting up a good record-keeping system, you’re able to then manage and monitor and employee or a virtual assistant later on that’s taking care of all your marketing. In addition, it presents the opportunity for you to easily access any leads that come in at a later time, as well. Once we’ve got our systems sketched out, and we have an idea of what we’re going to do, the next is we’re going to go through the implementation process. Now, implementation; this is going to be, again, you are the one that’s going to be doing this. Up through implementation, it’s a handful. You’re going to have to put the time and effort in, but we’re talking about maybe a three-week process from start to finish here. So, in the third week or on the third step, we’re going to start implementing. What that means is we’re going to have to be rigorous with our consistency here. If we said we’re going to send out a mailer on a Monday, it goes out on a Monday. If the second mailer’s going out on a Thursday, it goes out on Thursday. But you’re going to need to set this up and stick to this schedule – the overlap and the record-keeping – that you initially wrote down. This is going to allow us to determine what is reasonable. What’s a reasonable expectation on the timeframe to set up the marketing campaign, to take income and calls, to monitor everything that’s going on, and keep the good records. How long should it take? How much effort should it take, and what needs to be changed? So, you’re going to be documenting all of this stuff, and then you’re going to make an adjustment until you have a flow that is comfortable, that is pretty easy to adjust if need be, and it’s easy for you to monitor so that when you hand it to somebody else, they can step into your position, and you know that it’s being done. That leads us to the final step, and that’s automate. Up until this point, we’ve been planning and testing. Just planning and testing. Planning and testing. We’ve put the marketing plan together, we determined how we’re going to send over things now, how it’s going to overlap to make sure that these leads are consistent. Now, we’ve moved into the step of when the calls start coming in, and things start getting implemented, this kind of needs to be changed. Now, we’ve got a pretty decent system. It’s time to write down that plan. You probably have been taking little notes and things are going along the way, but when it’s time to automate, you have to write down an overview of the plan, and it might look like this: “I’m going to have three mailing campaigns, and this is what they’re going to be. This is where I get the data to pull these lists together. This is where I upload the lists to send out the postcards, or this is who puts together the postcards and puts them in the mail.” Whatever. You just have to detail that, and then if you’re doing email campaigns, these are the email campaigns that I’m working on, this is the person that puts the list together, these are the messages. All of that kind of stuff, you have to show your plan or write it down so that you can hand it to somebody else, and they can implement it. Next, you’re going to define those expectations. The expectations of the person that’s going to be taking over. What do you expect from them? What are you anticipating their role to be as your assistant? As your marketer? That’s really what this boils down to. Are they just somebody that’s going to be pushing buttons, or do they need a little bit more experience, and a little bit more hands-on know-how if they’ve worked in marketing before? These types of things. Third, you’re going to locate and train a replacement. Well, there’s a lot of different places you can look. It might be as simple as talking to a neighbor who’s currently unemployed and needs a little part-time income, it might be going online to a place like Elance or Guru.com and hiring a virtual assistant from halfway across the world, but it’s finding somebody who works well with you that you can talk to, or at least communicate with over the internet, that knows what they’re doing, and can consistently step into your place and this situation. You also have to have the ability to train them, and that’s where this stuff is going to come into play. Setting the expectations of this individual, making sure that they understand, and taking it to the next level, and going over your plan, and how they’re going to implement it. Making sure they understand it, making sure that they do what needs to be done – that is a vital part of this automation. And finally, you’re going to be stepping into the management role; managing and evaluating. Up to this point, in order to get this thing consistent, you’re talking about a couple of hours every week that you have to make sure that you spend just to get this thing ready to role. It’s time that if you had not worked to automate this, you’d have to spend every single week, and it’s the reason that you probably don’t have a very consistent marketing machine. Many of my clients don’t have consistent marketing machines when they start working with me. It takes time, it takes energy, it takes effort, and really, a commitment to make sure that it is consistent. What I’m saying and asking you do to, and I ask my clients to do all the time, is to dedicate time upfront, put a plan together, go through some scheduling and monitoring, look at the implementation, make some small changes, and get your plan together, and when that’s done, all that time that you put into it upfront, you’re done with it. Now, all you have to do is make sure that your plan is implemented by someone else. You find a replacement, you train them, and once they’re trained, you just monitor. Make sure that they get it done, and make sure that you’re managing them to do it on a timely basis. This will free up a ton more time to go out and look at properties, make more offers, do more deals, and make more money. It’s, again, a little bit more time up front, little bit more planning, but when it’s implemented, it has really massive effects on your bottom line, and it happens overnight. So, I encourage you to take the time, work on your marketing plan, put it together, and get it to automation because the faster you do, the faster you’re going to see the impact in your business. That’s all for today’s training. I just want to thank you for joining me, and until I see you again, I wish you the best of luck in your real estate investing.